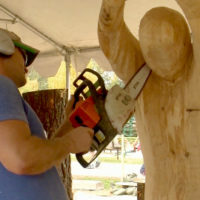 A Kelliher woodcarver shares his inner angst with viewers as he walks thru the process that enabled him to carve his first ever life-size Angel not in the privacy of his shop but in full public gaze over 3 days last fall at the Hackensack Chainsaw Event. Inspired by an Italian sculpture of the Archangel Michael’s conflict with the Devil, Ethan Elgersma chose to experiment in public. It was Elgersma’s first time carving alongside the pros at Hackensack and Common Ground documented the whole process as he re-created the epic conflict in wood. The final sculpture attracted bids in excess of a thousand dollars as the destiny of the Angel with 9-foot wings and the horned dragon hung in the balance.